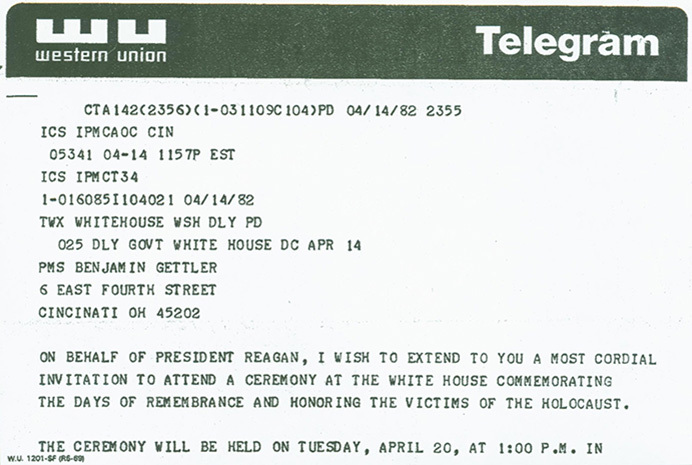 That visit, which was also attended by Cincinnati Mayor Ted Berry, was a very sentimental one for Gettler, not only because of his strong support for President Reagan, but also because of his deep connection to his Jewish heritage and community. The occasion for the visit was a ceremony to remember and honor the victims of the Holocaust. Gettler grew up during the Holocaust, and contributed to the Jewish community throughout his life through such organizations as the Jewish Institute for National Security Affairs, the Jewish Hospital of Cincinnati, and the Rockwern Charitable Foundation. A personal invitation to the White House is a tremendous honor, and something that only comes because the president has noticed your role or contributions to society. Gettler had already met great business and social success before his visit with the president, so it’s the small things, quite literally in this case, that he kept from his visit that strike me. 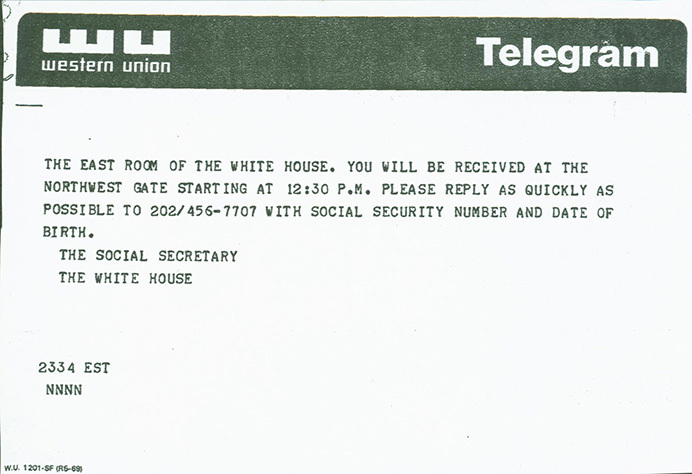 On his visit by personal invitation from the president, Benjamin Gettler brought back a couple of napkins, a blank sheet of paper from a notepad with a watermark of the Presidential Seal, and five jelly beans. I find these mementos really endearing because it’s so personal, especially the jelly beans. Ronald Reagan loved jelly beans (and evidently everybody knew this – it has become a part of presidential pop culture). So much so that Jelly Belly supplied the White House with jelly beans all eight years of Reagan’s presidency, including three-and-a-half tons for his inauguration. 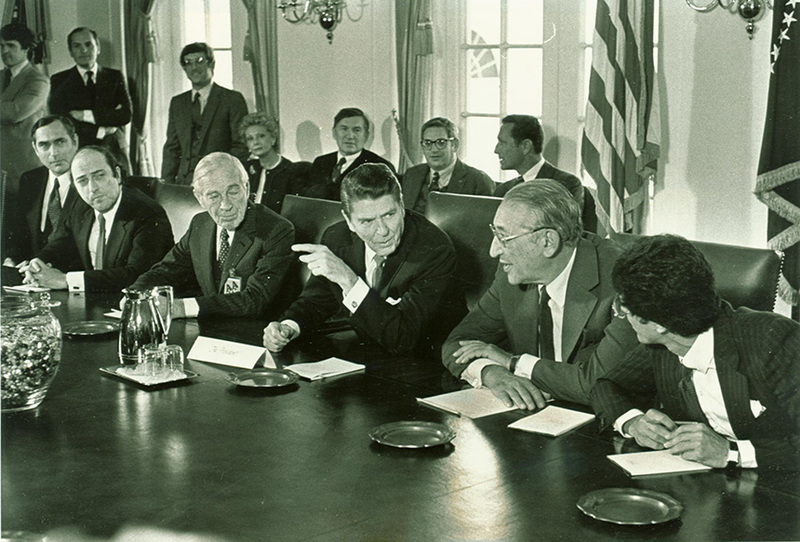 There is no shortage of images and articles connecting Ronald Reagan and jelly beans, you can even see them directly in front of Reagan in this photograph from Gettler’s visit (whom you can see sitting behind Reagan). It’s really intriguing that Gettler traveled to the White House to attend a Holocaust remembrance ceremony and chose these humble objects to keep as mementos. Certainly claiming a memento from a visit with the president is justified, and I can’t think of a more appropriate keepsake than the president’s favorite candy, to show that Gettler was there. 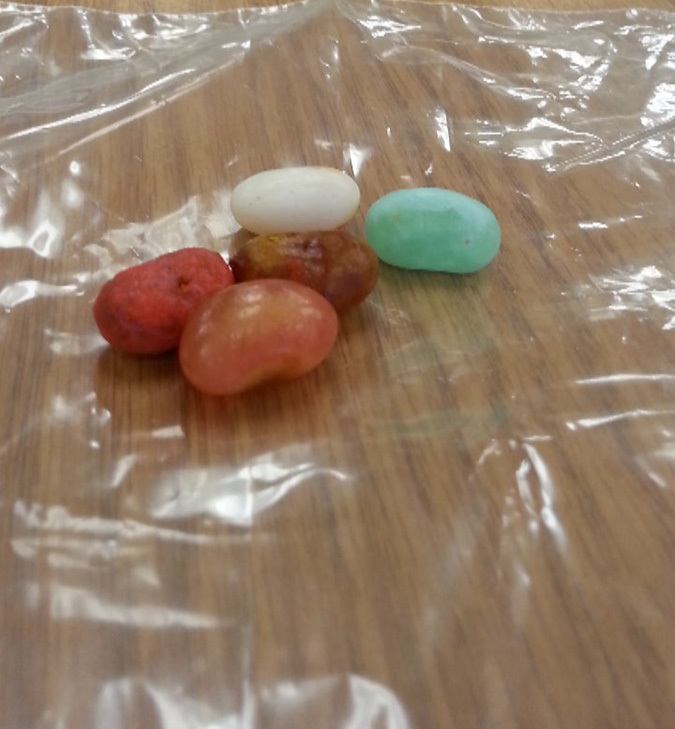 I’m also intrigued that the jelly beans have lasted this long! Watch for a future blog post showing how the Libraries will preserve them for long-term storage!